Happy fall Brunswick and beyond! Grab yourself an apple and enjoy the September Brunswick Real Estate News. 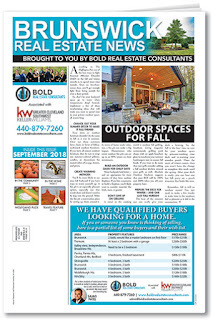 On the cover read a great article on how to prepare outdoor spaces for fall. You'll get some great ideas. page two will fill you in on some fun fall activities to keep you busy from apple picking to a medieval festival.